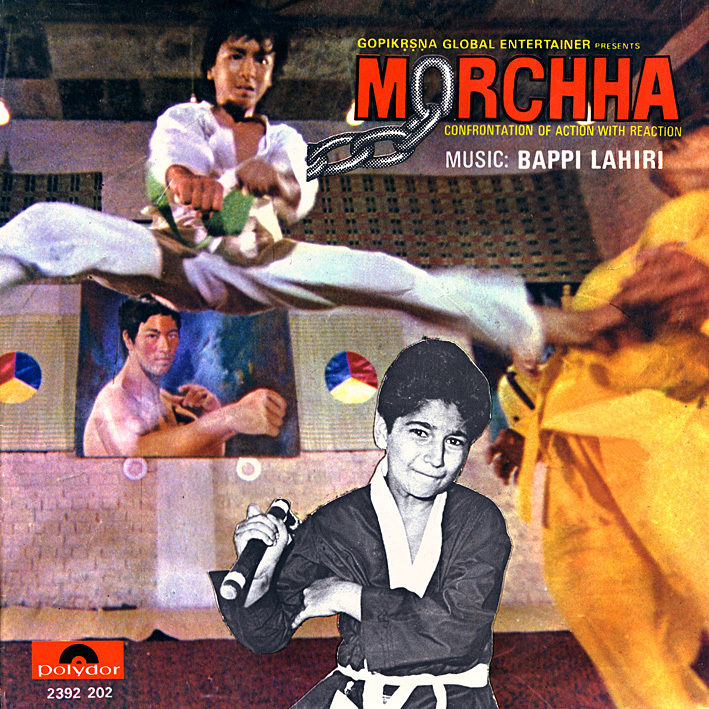 There's a martial arts theme running through the next few posts, starting with the soundtrack for 1980's 'Morchha'. I've no idea what the film is about; the scarcity of mentions and shortage of video clips online would suggest it's not very well known. 'Confrontation of Action with Reaction' seems to be a tagline of sorts though, whatever that may mean. The music is Bappi Lahiri doing what he does best, or worst, depending on preference. There's a chance I've become more lenient towards his brand of disco since I first discovered him, or maybe 'Let's Dance For The Great Guy Bruce Lee' just manages to stay on the right side of cheesy. It's a proper dancefloor stomper based around a highly infectious guitar & synth riff, with anthemic vocals (Annette Pinto) and featuring a cool sax solo. One to get stuck in your head, and to make sure it does they feature it twice. The Caribbean flavoured 'Koi Ban Jaye Apna Yaar' is similarly hard to resist. I've mistaken tone for content in Bollywood songs previously but I can't imagine this one being performed in anything but happy circumstances. 'Paheley To Bhajia Paao Tha Mushkil' is fun, bouncy and has a swing feel; possibly a bit silly ("Thank you ver-ee much, Kung Fu Ka-ra-ha-te"), and 'Dil Dena Hai To Aaj Hi Dedo' has surf guitar, relentless percussion, big band backing and an abundance of different breaks and interludes; glorious stuff. I really like this album, and I'm kind of curious about the film too. I have to admit that Babbi Lahiri's music is also a guilty pleasure of mine :) Looking forward to this one. Thanks PC. Just curious: It sounds like tracks #1 and #6 are identical. Are they? Again I had to check filmography of Bhappi Lahiri to know about this album. P C, sound quality is excellent but can't say much about album it may be masterpiece for Bhappi lahiri's ardent fans they may not find it elsewhere. It fell good to get 3 albums within a fortnight.